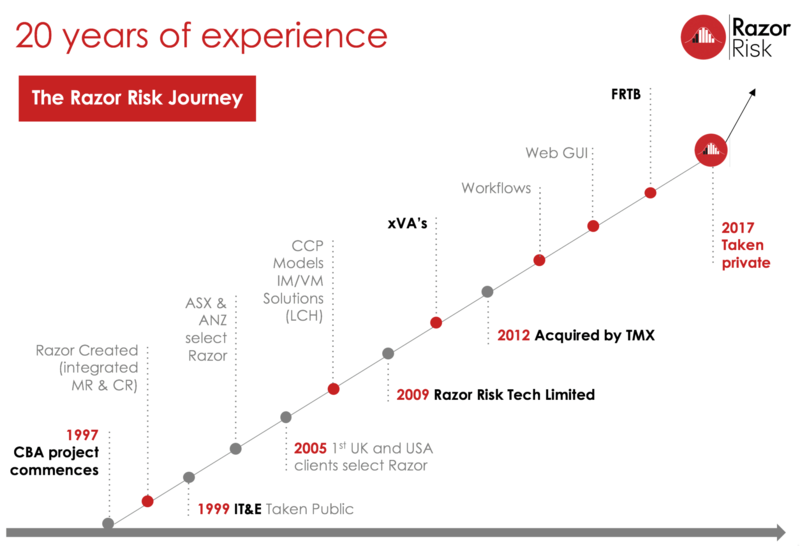 Razor Risk has a long history, initially as an independant company in 1998 and recently part of the Toronto and Montreal Exchange (TMX) group. The company has grown as the platform acquired customers and now has teams in two continents. 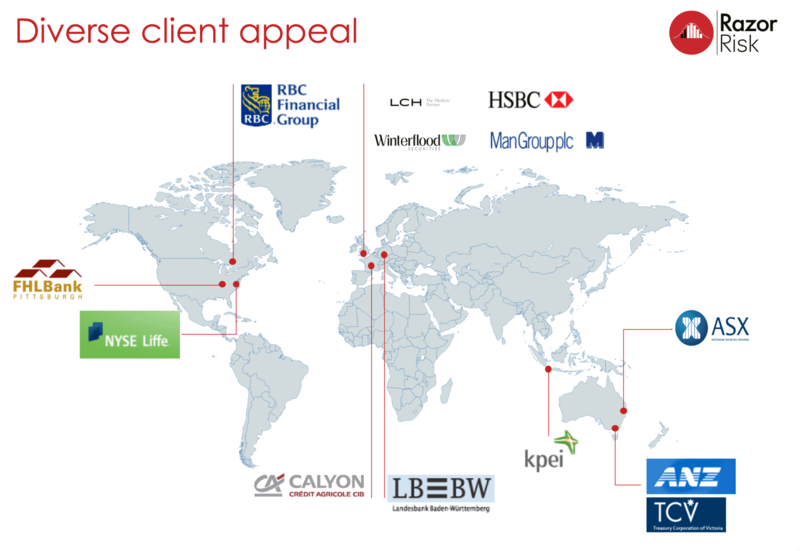 Now fully independant with staff in London and Sydney, the company has strong client list with the platform serving the needs of thousands of capital markets professionals around the world. Our current team includes talented and experienced people who drive forward the Razor business to meet our customer needs. We include deep software and hardware expertise to develop and deploy our high performance platform, along with deep product and pricing knowledge to power our analytics. Our first-rate sales and delivery teams take our customers through from initial contact to live deployment and maintain an on-going relationship with our customers. Adding people to the team who bring energy and enthusiasm but need to acquire knowledge and skills, is important for our business. We will work with staff to develop their skills and knowledge through training and mentoring to suit your specific needs. We expect you to actively acquire knowledge of the products traded in the capital markets, how they work, why they are used and how there are priced. At the same time we will teach you about our platform and how to deploy and configure it for our customers so that you become a trusted expert on the platform overall. The Razor platform can be used to enable strategic decision making about the desks, portfolios and products within a capital markets firm. With recent regulations especially around capital usage firms need to know how they allocate and consume capital to a detailed level. The overall trend in the market is to incorporate into the daily trader decision making the capital consumption of trades, whether OTC or cleared, as this has become a major influence on sell- and buy-side relationships and the profitability of most firms. We want to hear from individuals who share this strategic view and want to help us develop the platform alongside our customers. We have a product roadmap that will evolve by responding to customer feedback but also towards the long term direction that Risk departments are heading. When we next have vacancies we will post them here. 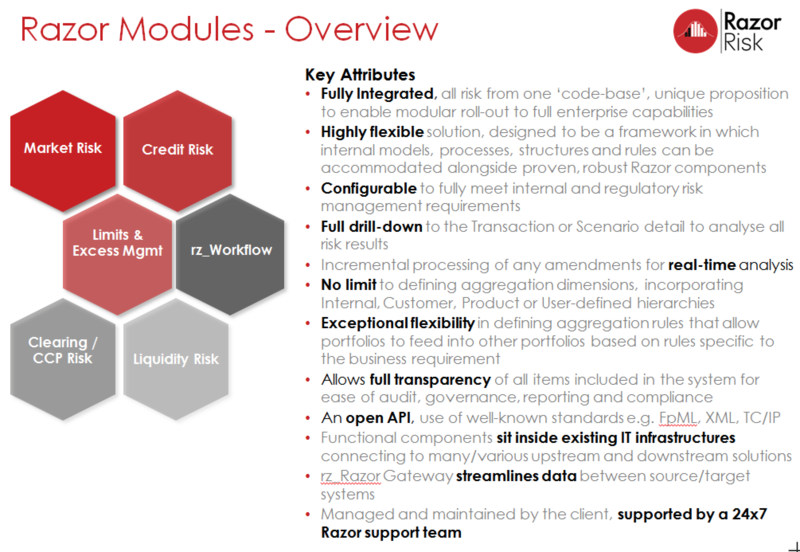 The Razor platform offers a powerful and flexible solution to measuring and managing the many aspects of Risk in a capital markets firm. Originally market and credit risks were the focus but the market needs have broadened into clearing, xVA and counterparty real-time limits management, as has our platform. We have customers around the world which deploy and use our software for thousands of people. Our customers include trading platforms, CCPs, banks and other capital markets players. Each one relies upon our platform to deliver the critical analytical insights they require to run their businesses. If you are interested in working with us, even if we haven’t listed your ideal role above, get in touch, as we always welcome interest from talented and experienced people.